I was quite surprised when I got this small box in the mail. I knew I was getting an Oransi Ionic Air Purifier for the Refrigerator to review. I guess I just thought it would be bigger. I was a little hesitant because I wasn't sure this little thing would do anything. I was very surprised at how well it worked. Let me start from the beginning. It is smaller, smaller than a 12 oz soda can. So, you won't have to worry about it taking up much space. It is very easy to set up. All you need to do is pop in a couple of AA batteries, turn it on and place in your refrigerator. I love that there are no filters to change, and the batteries should last for about 90 days. Eliminate food odors in your refrigerator. Sterilize fridge once every hour. Neutralize stale or foul odors with fresh air inside refrigerators, closets. I can't verify all of these claims without scientific testing. I can say that it did eliminate odors. I made sure to wait until after Thanksgiving to do this review, when I knew my frig would completely full with a variety of items. It did work on odors and the food did not take on the flavors of other items in the refrigerator. I've never had a problem with mildew. So, I really can't say one way or another on that except there is no evidence of mildew in my refrigerator. I love that it is so small, that there is nothing to clean, and that it eliminates odors. I really hope that it is eliminating bacteria and sterilizing the refrigerator but I really can't prove that it does. As for food spoilages, I haven't really tested that aspect. I think that this is the perfect item for anyone and everyone. It doesn't take up much room and really does seem to work. I think it might be the perfect gift for those hard to buy for people. It may not have a lot of glitz and glamor but it is something they can use all year and for many years to come. 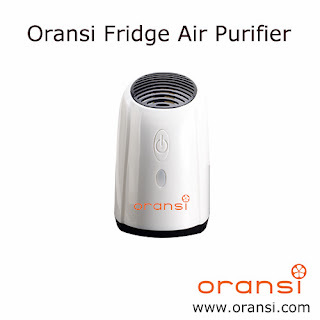 You can purchase the Oransi Ionic Air Purifier for the Refrigerator for $29.00. What is even better is that one of my lucky readers will win one to keep for themselves or to give to someone else. Just use the Rafflecopter below to get your entries in.